Lori Cooney is no stranger to the phrase “follow your dreams.” As project coordinator and universal instructional design specialist at University of Massachusetts Boston’s Institute for Community Inclusion (ICI), she understands that in order to plan for a career trajectory that you can be proud of, it’s helpful to take some time to learn more about yourself as a person by determining what your goals and interests are. That’s why, together with FableVision Studios, she heads up the development of Future Quest Island, an online adventure game that prepares students for college and career readiness. For over four years, ICI and FableVision have worked together to create a game that stays true to the mission of supporting students of all ages and abilities to follow their dreams. 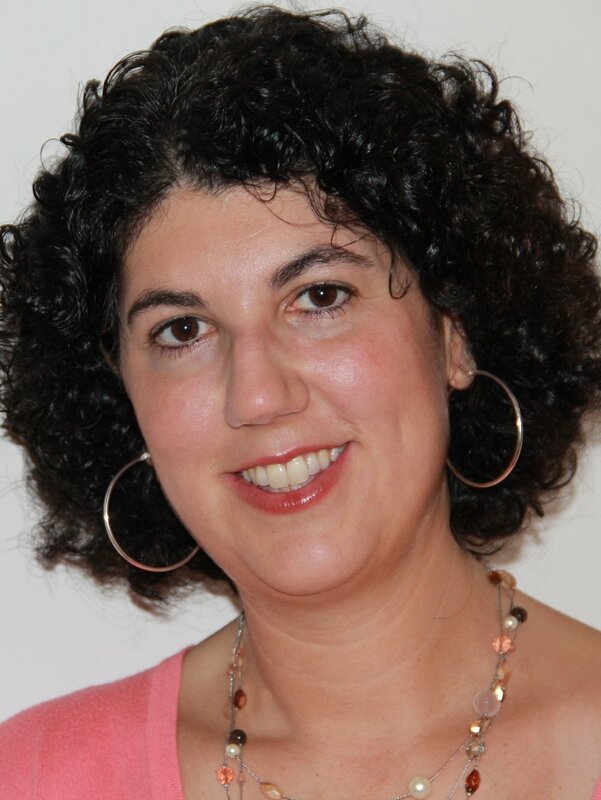 Dive in for a deeper look at the core values that drive all of ICI’s efforts, the game that’s getting kids excited about planning for their future, and learn about Lori’s professional background in teaching and communications—as well as her stint with stardom on the big screen! How did you decide on your career trajectory when you were younger? When I was a child I wanted to be two things: a famous actress and a teacher. I started babysitting and working with kids in middle school, throughout high school and in college. As a high school student, I volunteered in an afterschool program with students with special needs and was a Respite care provider in college for my cousin with Down syndrome and autism. Ironically, I went to college to be a teacher, but transferred and received my degree in marketing and communications from Emerson College. I spent some time working in advertising and sales, while pursuing my acting career. Right after college, I was signed by an agency in New York and was in some commercials, on MTV, and was an extra in a movie. After that, I jumped into sales so I could travel Europe. Eventually, I settled down, got married, and went back to school to be a teacher. I had my daughter and received my Masters in Technology Education from Lesley University all at the same time in 2002. I have been working in education ever since. Acting and teaching are very much alike. I never in my wildest dreams would have guessed I’d be here today designing and implementing a research-based college and career-readiness game for all students, funded by the Federal Office of Special Education Programs. I am very proud and extremely grateful for this opportunity and am looking forward to seeing where the wind takes me as I continue with my adventurous career. How have you noticed the education technology industry changing since you first entered it? It’s interesting to me how quickly things change in technology education and how inexpensive it is today to get a device in the hands of a student with mobile devices and Chromebooks. The most valuable change in technology education is the ease of using mobile devices for assistive technology. The built-in features on iOS and Android devices provide individuals with access that is cost-effective, readily available and extremely powerful. This levels the playing field for all individuals with all kinds of disabilities. ICI strives to create a world where all people with disabilities are welcome and fully included in valued roles wherever they go. Tell us more about how ICI seeks to accomplish this goal. All of our efforts stem from one core value: that people with disabilities are more of an expert than anyone else. For over 40 years, Institute for Community Inclusion has worked on both a national and international capacity to create a more inclusive world for people with disabilities. Our core mission is to ensure that people with disabilities are given the same opportunities to dream big and make their dreams a fully included, integrated, and welcomed reality whether it’s at a school, workplace, volunteer group, home, or any other part of the community. You wear many hats at ICI! What is a universal instructional design specialist? A universal instructional design specialist is a unique position that combines Universal Design for Learning (UDL) and instructional design strategies (i.e. online learning, blended learning, varied assessments) to ensure that a tailored curriculum is delivered and accessed through multiple formats and methods so that all students can demonstrate knowledge. How did you come to cross paths with FableVision? Prior to joining the ICI, I worked as a technology coordinator for Bishop Stang High School where I served on a MassCUE special interest group. One of my technology colleagues, Gaby, arranged for my chronically ill daughter to receive a copy of Animation-ish back in 2008 from Paul Reynolds at FableVision. Ever since then, I have been a big fan of the company and their philosophy of helping all children be the best they can be. When Future Quest Island was being considered for a large technology grant in 2011, I was attending an open house at FableVision and discussed a potential collaboration in moving forward. The rest, as they say, is history. Together, we’re preparing students for 21st century skills and college and career readiness with Future Quest Island. As the lead person on the project, can you tell us more about the game? Future Quest Island is an online adventure designed around national and state college and career readiness standards to assist all middle school students in preparing for high school and life beyond with online activities that promote student self-discovery, advocacy, exploration, organization, and technology literacy skills. 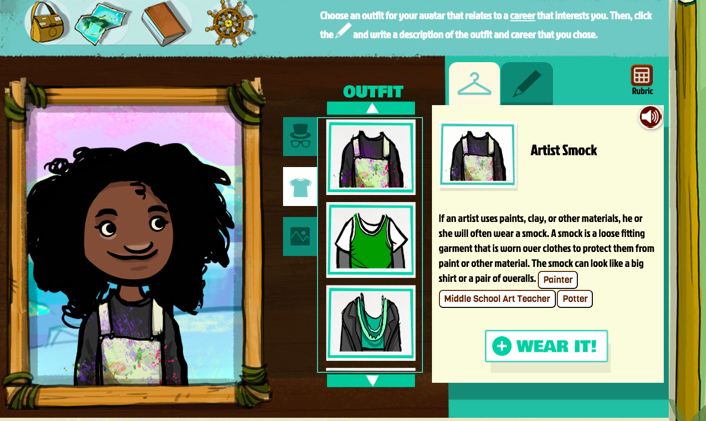 In this game, students create college and career, self-determination, social and online safety goals and perform a series of activities that are automatically saved in the online portfolio, also known as an Individualized Learning Plan (ILP). The ILP contains each student’s personalized learning goals, writing activities, and thought collages and organizes them by theme and a “Transition Passport.” A Transition Passport contains all transition-related activities to be used in Individualized Education Plan (IEP) meetings and/or in other meaningful ways. Every activity has a coin reward that students earn from the teacher to purchase new items for customizing their hut, which is a huge motivation on the island. 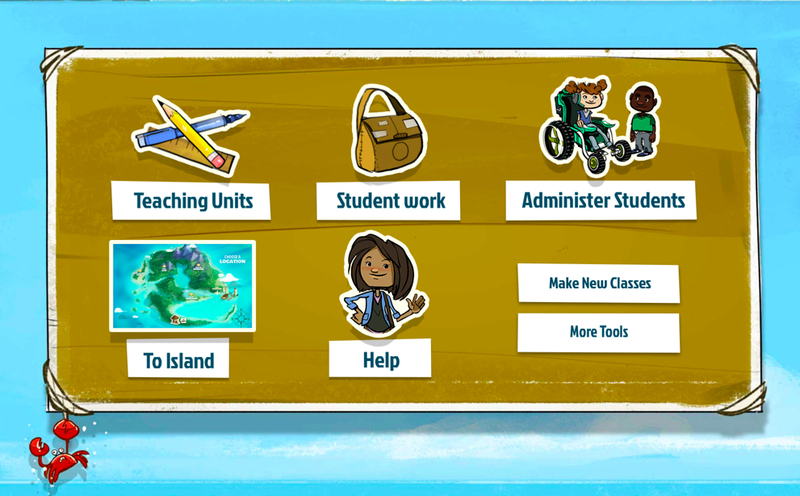 There is also a Future Quest Island Teaching Toolkit (TT), designed to provide teachers with information on how to successfully implement Future Quest Island. In the toolkit, teachers can access the recommended scope and sequence of teaching units, including lesson plans and supplemental lesson plans that promote college and career readiness among middle school students. How do you tailor the content of Future Quest Island to be inclusive and accessible to all students? The entire island is built with accessibility in mind and we tailored the content to be universally designed and inclusive in multiple ways. All of the avatars are designed to be inclusive of the student population with a variety of abilities, colors, genders, shapes, and sizes. The game is accessible with built-in voice over animation, text-to-speech, speech-to-text, and closed captioning. Every activity on the island has an image response system built in, which is a graphic representation that helps students generate words and sentence starters so that all students regardless of disability can complete the activity. Students with print disabilities can use a screen reader or utilize the built-in voice over animation, while students with hearing impairments can turn on closed-captioning on videos. 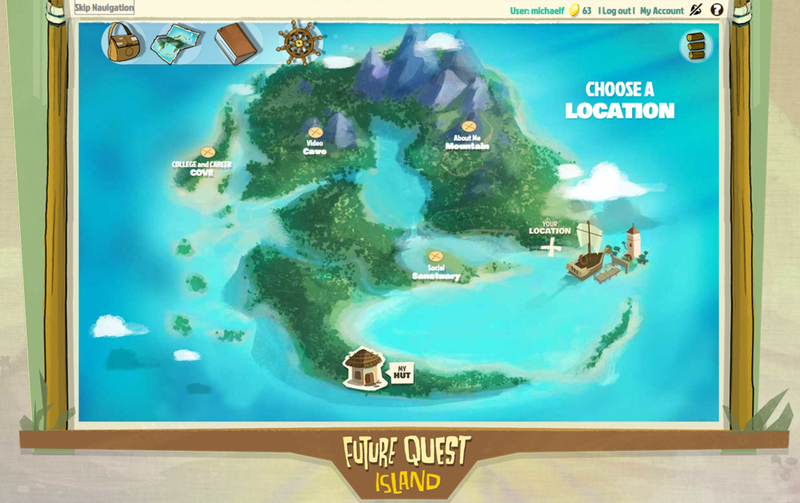 Future Quest Island was designed to work on all computers and mobile devices with internet access, eliminating the need for apps and software installation which can be a huge barrier for students. Future Quest Island is among one of FableVision’s long-term projects. What has your experience been like working with us for four years? Working with FableVision has been a fabulous experience. The team of individuals we worked with since the beginning of this project in 2012 all the way to 2017 has been essential to the success of the program. From concept to design to installation (and sometimes revision), the entire team—Brian, Loren, Keith, Michael, Polly, Karen, Paul, Chris, Adam, and Sarah—has been nothing short of amazing. I wholeheartedly believe the FableVision team wants this program to succeed as much as we do. Setting personal, professional, and academic goals is a big component of Future Quest Island. What are some of your long-term and short-term goals for Future Quest Island? For a short-term goal, we would like to continue the work and get it in the hands of students in grades 3-8. My long-term goal for Future Quest Island is to continue building the program so it can be a career planning tool from elementary to middle to high school and the portfolio will be their Individualized Learning Plan that transitions with students as they advance their education so that their teachers, guidance counselors, IEP team, future schools, families, and potential employers can see their career goals. If you could pass on a piece of wisdom to adolescents thinking about their own career path, what would it be? I would say keep an open mind, listen, observe, ask questions and most importantly, never say never. There are so many careers that haven’t even been created yet and it’s amazing to learn about ourselves as the world around us continues to evolve. Work is no fun without music to keep you grooving. What’s your favorite album to listen to while working? What’s your favorite album to listen to when you have friends over? My favorite album of all time is Tigerlily by Natalie Merchant. It has the most inspiring song on it, Wonder, which is about a child who has a disability but is gifted in her way. The song has a special meaning for me with my own daughter and son who have both had a lot of health challenges. When friends come over, my favorite album to listen to is anything by Train or Rob Thomas. I just love them both. Sometimes, depending on the level of friendship, I’m known to take out my guitar and play some music for my friends.